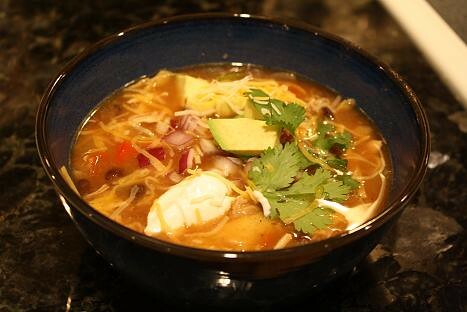 I’m pretty sure that I’ve had chicken tortilla soup at a Mexican restaurant at least once before, but I’ve definitely never made it from scratch. It has always been a dish that I wanted to learn more about and give it a try. Back in January I saw a Chicken Tortilla Soup recipe that the Pioneer Woman posted. I made a mental note that this would definitely be part of my culinary journey this year. When this week arrived and I knew I was making this recipe, I was pretty psyched. It looked healthy and packed full of vegetables, so I was in. I rushed out to the grocery store and began cooking it straight away this week. Yet again the rotisserie chicken saved me a ton of time and energy. You could definitely buy uncooked chicken and make it as the recipe suggests, but P Dub (that’s the Pioneer Woman for those of you who don’t follow her) gave permission to use the rotisserie chicken, so I proceeded (and so should you). Plus the chicken is already packed full of flavor, so this is a great time saving option. This dish was a cinch to make and was ridiculously flavorful. The garnishes are a must, so don’t forget them. It’s definitely a one pot wonder, and I HIGHLY recommend that you make it. It’s even better tasting than it looks, and that is saying a lot! I can’t wait to hear your feedback when you make this. Click here as fast as you can for the recipe and step by step instructions. Um, holy cow!!! Go make this soup. Just do it. You'll thank us! It was sooooo delicious and sooooo healthy & yummy! !